Texas housing sales increased 5.2 percent from January amid lower mortgage rates and decreased price pressure. 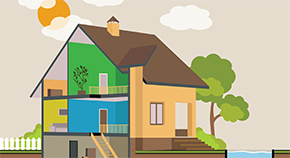 Supply indicators were mixed with single-family construction permits and total housing starts stabilizing after a shaky end to 2018, but single-family private construction values continued to slide. On the demand side, the typical Texas home continued to average just 60 days on the market and sold above 95 percent of the original list price. Lower mortgage rates provided incentives for prospective purchasers, but housing affordability remained a challenge across the state. Overall, the healthy labor market, population growth, and the economic expansion supported strong housing demand. The Texas Residential Construction Cycle (Coincident) Index, which measures current construction activity, inched downward as construction wages and employment calmed after a year of strong growth. 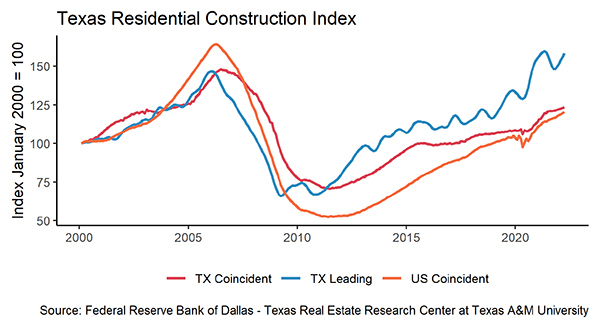 The future outlook, however, remains positive as indicated by upticks in the Texas Residential Construction Leading Index. 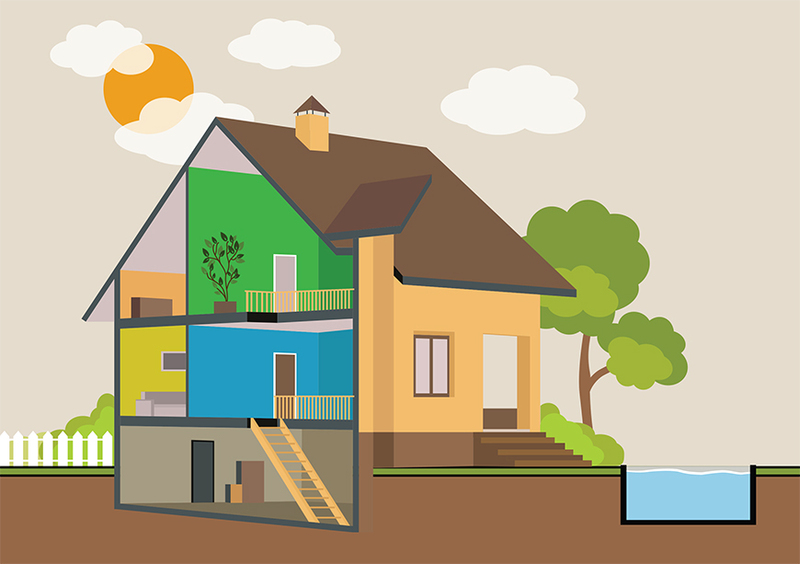 Lower interest rates and the extended economic expansion bolstered the industry outlook. Single-family housing construction permits balanced for the second straight month after a sharp drop in December. San Antonio accounted for most of the positive growth with monthly permits doubling to a cycle high of 796. Despite a 14.6 percent decline, Houston led the nation with 2,846 permits followed by Dallas-Fort Worth (DFW) at 2,698. Austin ranked fifth nationally with nearly 1,400 monthly permits issued. Across the major metros, however, single-family permit issuance normalized compared with early 2018. Total Texas housing starts recovered most of January's losses, driven by growth in the apartment market. Single-family private construction values, however, continued to slide as the 4Q2018 drop in permit issuance caught up to building activity. The decline was most apparent in DFW where single-family construction values fell 8.8 percent in February. Values decreased for the third and fourth consecutive months in Austin and San Antonio, respectively, but balanced in Houston after a large November drop. Texas' months of inventory (MOI) inched upward but held below four months. A total MOI around six months is considered a balanced housing market. Homes priced less than $200,000 and between $200,000 and $300,000 maintained MOI of 2.9 and 3.4 months, respectively. The rate of Multiple Listing Service (MLS) listings hitting the market, however, eased after surging through much of 2018. Fewer new listings and a recent uptick in sales could limit further MOI expansions. Most of the major metros reached annual highs in MOI despite declines in new MLS listings. Dallas and San Antonio ticked up to 3.5 and 3.6 months, respectively, while Houston balanced at 4.1 MOI. Fort Worth maintained the lowest MOI at 2.7, up from 2.0 months in February 2018. Austin was the exception where steady sales snapped a six-month stretch of inventory increases. 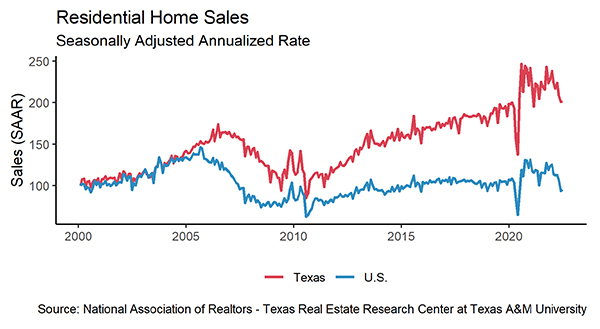 Texas total housing sales increased 5.2 percent to its highest level since July as lower mortgage rates and decreased price pressure provided some breathing room to constrained markets. Resale transactions generated most of the improvement with activity increasing for the second straight month. A record-level of homes sold in the $200,000-$300,000 price range, while the bottom cohort (homes priced less than $200,000) posted its second straight monthly increase. These two cohorts account for more than 70 percent of single-family sales reported through MLSs. Furthermore, the luxury market (homes priced more than $500,000) posted an 11.9 percent monthly increase, recovering all of its 4Q2018 losses. All of the major metros posted positive sales growth. Activity trended upward in Central Texas with sales increasing four out of the last five months in both Austin and San Antonio. Fort Worth posted the largest monthly growth at 12.4 percent after adjusting downward in the second half of 2018. Similarly, Dallas and Houston transactions stabilized, increasing 6.0 and 6.5 percent, respectively. Despite slow and steady increases over the past year, the Texas average days on market (DOM) balanced at its four-year trend of 60 days and corroborated healthy housing demand. Austin and San Antonio accounted for most of the monthly decline as the DOM sank to 56 and 59 days, respectively. Houston homes averaged 57 days on the market but trended upward. The North Texas market continued to steady after a prolonged period of imbalances. The Dallas DOM surpassed 51 days for the first time since 2013 while Fort Worth reached a three-year high at 44 days. Softer economic data, particularly in February's U.S. employment report, decreased inflation expectations and weighed on interest rates. The ten-year U.S. Treasury bond yield fell to an annual low below 2.7 percent, while the Federal Home Loan Mortgage Corporation's 30-year fixed-rate dropped to 4.4 percent. Texans capitalized on lower rates, pushing mortgage applications for home purchases up 11.2 percent in the first two months of 2019. Refinance mortgage applications, which are more sensitive to interest rate fluctuations, increased 20.2 percent year to date. In addition to lower mortgage rates, home price increases continued to moderate after substantial post-recession appreciation. The Texas median home price balanced at $235,500, just 2.6 percent above year-ago levels. While still increasing, home prices are no longer soaring at double-digits levels YOY like in 2017. Austin maintained the highest median price but fell below $300,000 for the first time since spring 2018. 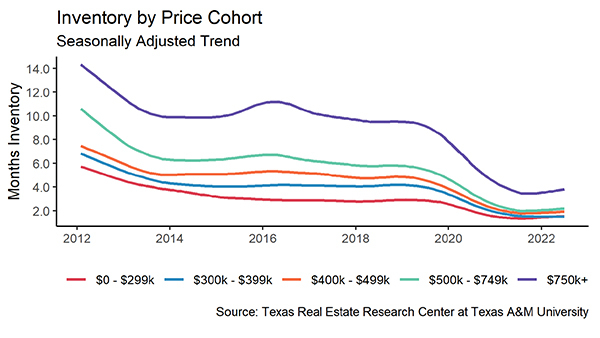 Healthy activity in the $200,000-$300,000 cohort, which constitutes the lower end of the Austin market, provided the recent relief in price pressure. The median dipped for the third consecutive month in Dallas to $282,100 and fell below $238,000 in Houston. Fort Worth and San Antonio median prices, however, increased more than $3,000 between January and February, reaching $235,400 and $229,300, respectively. The Texas Repeat Sales Indices corroborated movements in the major metro median prices. In Dallas, YOY growth slowed to 2.8 percent, the lowest in more than six years. The metro's list-to-sale price balanced at 0.96, down from its peak of 0.98 in January 2017, indicating solid market fundamentals despite the recent price slide. Houston's repeat sales index decelerated to 3.1 percent, while the Fort Worth index climbed above 5 percent. 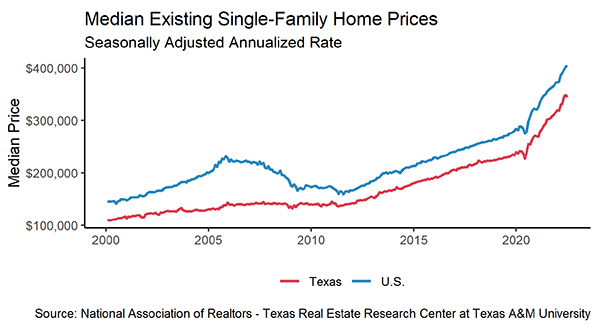 Central Texas observed steady annual price growth at 4.1 percent in both Austin and San Antonio. Despite the overall moderation, home-price appreciation continued to outpace wages and weighed on housing affordability. Although Texas' affordability remained favorable compared with other states, the gap is narrowing. This presents a significant challenge to Texas' demographic advantages that have supported its economic prosperity over the past decade.